Please refer to the following video link for information regarding the CX15 Rotary Cutter. 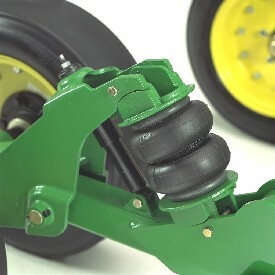 Lock-slide collar, included on all John Deere’s drivelines, helps the attachment to the tractor using your hands on the driveline and not on the collar. Professional seals on the cross kits allow for a lubrication interval up to 50 hours. 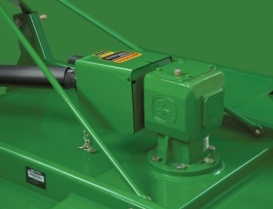 Grease zerks in the cap cross kits provide easy access for field lubrication. Large, dimpled floating disks reduce wear and improve the grease retention. Precision spherical ball-and-socket bearings distribute loading evenly and provide a long life and high performance. A lightweight driveline with a lock-slide collar makes it fast and easy to attach. The CX15 uses 12 hinge bushing segments per side, for a continuous hinge (front to back), providing superior resistance to the wear and tear caused by commercial usage. 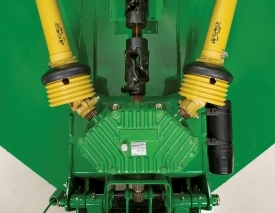 A transport lock flips over the lift cylinder for backup to the hydraulics when transporting or servicing the cutter. A wing lock is provided for additional safety during transporting or servicing. Additionally, the wing locks are spring-loaded so they can unfold against gravity on slopes up to five degrees. Hitches have a narrow profile and are 57.2 cm (22.5 in.) 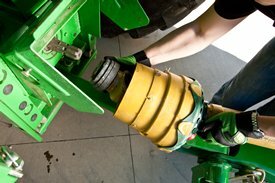 wide to allow a very tight turning radius, even when the tractor is equipped with dual wheels. Gearcases are provided with oil-level dipsticks. Spring-loaded check-valve vents are provided to release any air pressure that might build up within the gearcase and to keep the rotary cutter deck free of oil that would otherwise spew out of permanently open vents. All pivoting points that would benefit from greasing are provided with grease zerks. Wing hinges in particular are provided with individual grease zerks. It is important to note that these points require greasing infrequently; lubrication is for protection against seizing, not wear. The CX15 is equipped with three deck rings, which are welded to the underside of the deck, just inside the outer circumference of blade travel. The deck rings help to limit the upward deflection of blades when the blades encounter immovable objects, such as stumps and set-fast rocks. The CX15 and CX20 come standard with an industry-exclusive hydraulically-operated height leveling system with a swing-away parking stand that makes raising and lowering the cutter easy and safe. 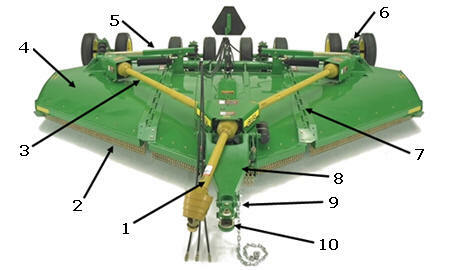 In addition, a manual-implement jack is in base equipment, so hitch leveling can also be adjusted without hydraulics. With this addition, the cutter will remain in the same position for long periods of time. CX Series Flex-Wing Rotary Cutters feature ground-control suspension, which is unique in the industry. This suspension includes a heavy-duty axle with six wheels and air springs with shock absorbers on all four-wheel assemblies. Shock absorbers provide a smooth ride for road travel and for hard and rough pastures, roadsides, etc. The shock-cushioning ability of the CX suspension is in a class by itself and contributes greatly to long, trouble-free operation of the machine. 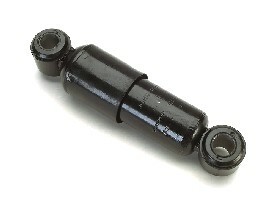 Center-section air springs typically carry 90 psi of air pressure. Wing-section air springs typically carry 60 psi of air pressure. All of the CX models are also available with springs and shock absorbers. It is the most cost-efficient way to cut roadsides, parks, cemeteries, airport fields, hydro, gas, and telephone easements, and all other types of open properties. Shredding stalks such as cotton, corn, and sorghum speeds up decomposition. 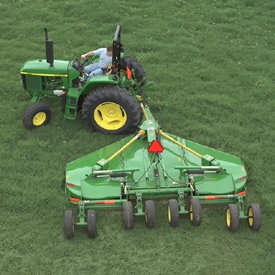 John Deere CX Series Rotary Cutters are commercial-duty. 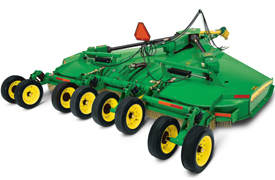 CX models are available in 4.6-m (15-ft) and 6.1-m (20 ft) cut widths; they cut brush 101.6 mm (4 in.) in diameter. NOTE: CX models are heavier built to cut at a 101.6 mm (4 in.) capacity level more frequently and for longer durations.